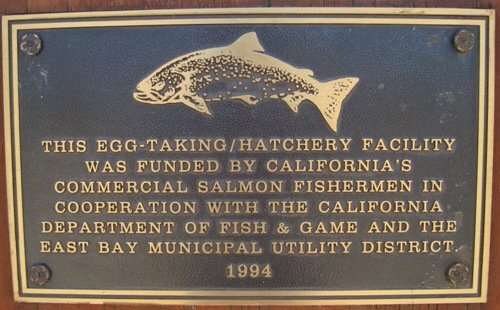 Managed and operated by the California Department of Fish and Game, the Mokelumne River Hatchery was built by the East Bay Municipal Utility District in 1964, as a way to better replace the salmon and steelhead spawning habitats that were disturbed by the building of the Camanche Dam, and originally consisted of one mile of artificial spawning channel for Chinook salmon and six concrete raceways for steelhead. By 2002 the facility had been completely modernized, with rearing ponds added to the spawning channels, a “bird cage” to keep out fish-eating birds, and a hatchery building with start-up troughs and incubators. The Hatchery is located at the base of the Camanche Dam at 100 feet above sea level; underground pipes bring water into the Hatchery from the reservoir. 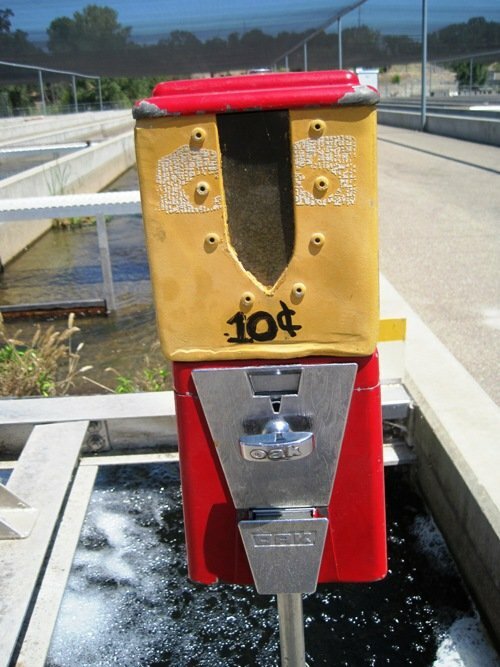 The water for the Hatchery building can be filtered, chilled, or aerated as needed to provide the best possible growing conditions for the fish. 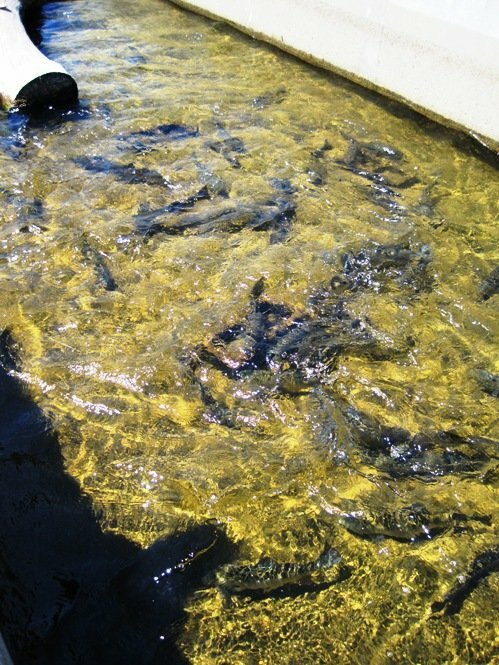 The Mokelumne River Hatchery supports Pacific Ocean commercial and sport salmon fishing and helps ensure the survival of Mokelumne-origin fish stocks, with goals to maintain viable salmon and steelhead runs, as well as protect and preserve the Mokelumne River. Research at the Hatchery focuses on determining straying rates of Mokelumne River salmon into other river systems, tracking fish survival as they migrate through the Delta, and reducing disease. 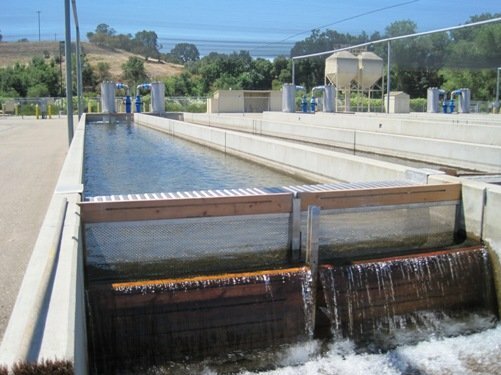 The Mokelumne River Hatchery produces millions of fish (the Hatchery aims to produce about 4.5 million salmon a year) and is designed for reliability, efficiency and flexibility of operation. The Hatchery is open year-round, and invites visitors to come often and take a self guided tour (scroll down for information on formal tours). 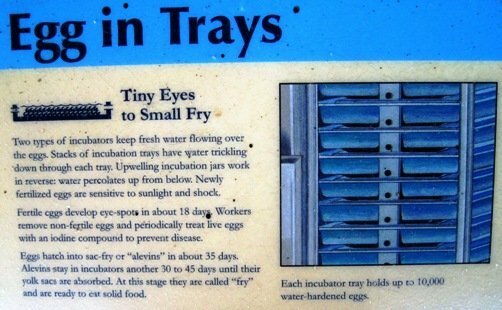 Depending on the month you visit the Mokelumne River Hatchery, you could find big fish, eggs, tiny fry, young fish growing outdoors or indoors, or fingerlings or yearlings ready for release to the river. 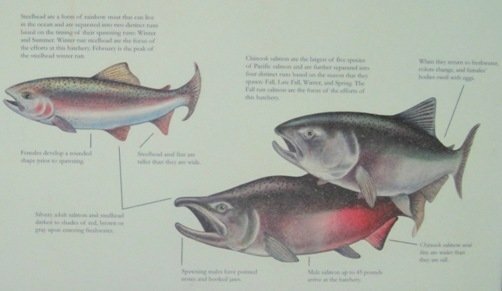 Displays throughout the facility illustrate the natural life cycles of Chinook salmon and steelhead, and show the methods used by the Hatchery for artificial spawning. – Fingerlings are started in the upper raceway ponds, and are periodically spread into the lower ponds when they outgrow their living space. – Salmon live in raceways from January to July, while the steelheads are there from March to January. Be sure to feed the fish while you’re enjoying the raceways. It only costs 10 cents – you can’t beat that! Using the latest technology for marking and coded-wire tagging fish, the hatchery’s AutoFish trailers have the capacity to mark and implant coded-wire tags very rapidly without any use of anesthetic or human contact. The coded-wire tags used are microscopic lengths of stainless steel wire, marked with rows of numbers indicating the agency, hatchery, and the year of the fish’s release. To begin the process, a tagging trailer is parked next to the raceways where the fish being tagged and marked and housed. 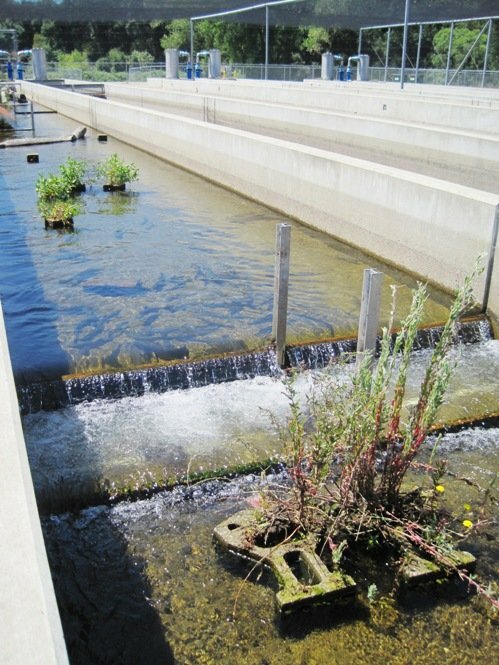 The fish are pumped from the raceway through the system, and then returned to a nearby raceway. When the fish are in the tagging truck’s internal holding tank, they are pumped into the sorting mechanism, which uses video imaging to determine each individual fish’s length before send them to their specific size line. 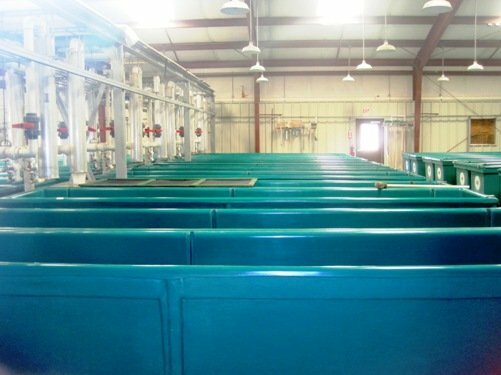 Once sorted by size, the fish move down tubes to holding tanks attached to fin-clipping machines that are pre-set to accommodate fish of their particular size range. From that holding tank, the fish swim into a channel where sensors track their progress to the clamping system. The clamping system holds the fish immobile for coded-wire tag insertion, while the imaging system determines the location of the adipose fin so the clipping mechanism can remove the tiny fin. Tags are implanted into the snouts of the young hatchery fish, and the adipose fin is removed on all tagged fish to allow external identification. The control system confirms the removal of the fin, and the fish is sent back to the hatchery rearing pond. 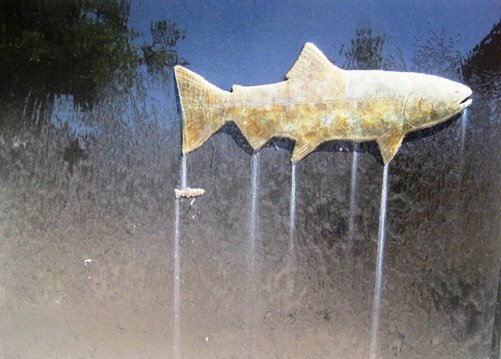 All this is completed in a matter of seconds and the fish never leaves the water. Upon their return to the hatchery as adults, the coded-wire tags are removed from the fish that are missing the adipose fin. 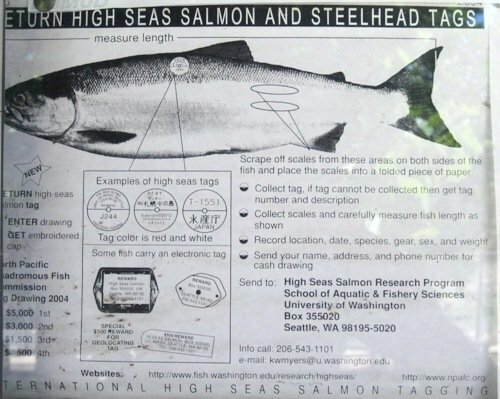 The removed tags provide information that will help improve the understanding and management of salmon and steelhead populations. – Collect the tag. If the tag cannot be collected then get the tag number and description. 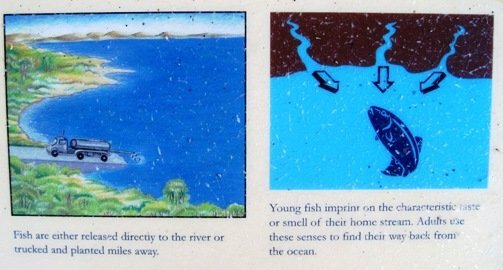 – Collect the scales and carefully measure the fish’s length as show in the picture below. Chinook salmon and steelhead trout are both Anadromous fish, which means they hatch in fresh water, mature in the ocean, then migrate back to freshwater streams to spawn. 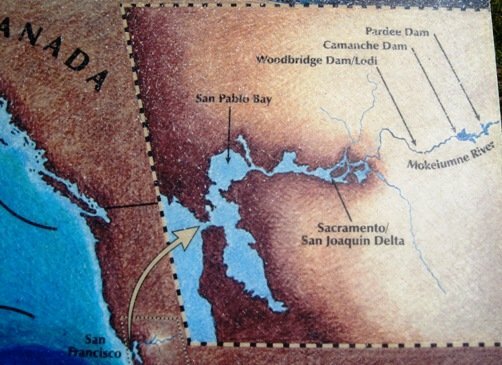 Beginning in the fall, salmon and steelhead begin to migrate, swimming up the Mokelumne River from the Pacific Ocean to spawn in the river and enter the Hatchery. 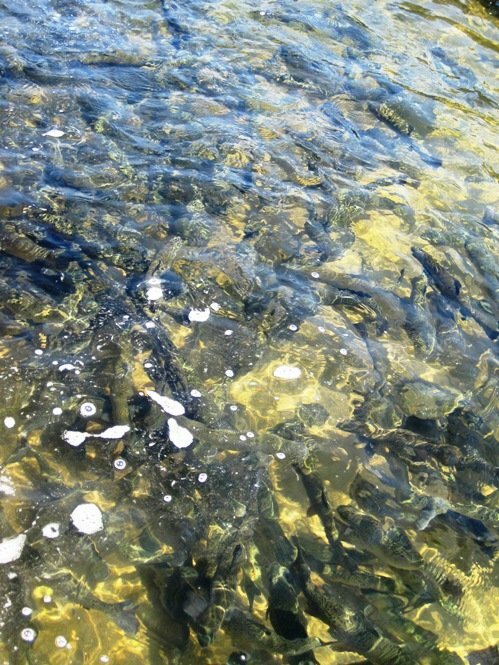 Salmon return to the Mokelumne River in the fall; most are between 3 and 5-years-old. Chinook salmon reproduce in a single event and then die. Their offspring migrate to the ocean within six months of hatching. 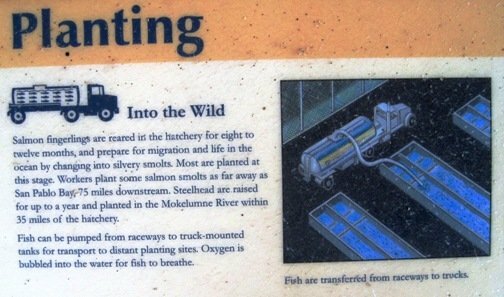 The Steelhead trout return to the Mokelumne River from fall to spring, at 4 or 5-years-old. 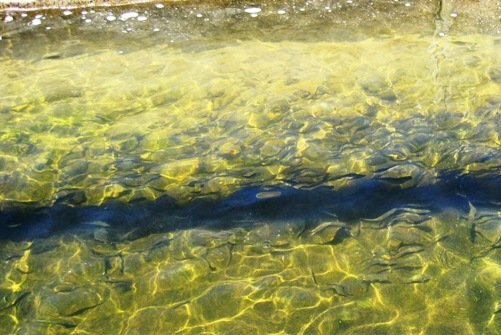 Unlike the salmon, steelhead can survive spawning to reproduce again; and their offspring live up to 3 years in freshwater before migrating to the ocean. Adult salmon and steelhead go through physical changes as they leave the ocean and return to freshwater streams. Their silvery sides darken to red, brown or gray, with males developing pointed noses and hooked jaws, and the sides of females becoming rounded, pushed out by maturing, egg-filled ovaries. The Chinook salmon is the largest of five species of Pacific salmon and is separated into four distinct runs based on the season that they spawn: fall, late fall, winter, and spring. The Hatchery focuses on the fall run salmon, which usually peaks in November; with the first salmon appearing in late September and the last in December. Steelheads are a form of rainbow trout that live in the ocean and are separated into two distinct runs based on the timing of their spawning: winter and summer. The Hatchery focuses on winter run steelhead, which peaks in February; with the first fish arriving in October, and the last spawning in May. Adult fish brought into the hatchery building are sedated. Ripe female salmon are harvested and opened to avoid damaging the eggs. Steelhead eggs expelled from live females by hand or by using air pressure through a hollow needle. 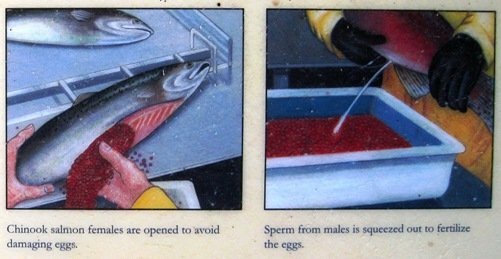 Sperm is squeezed from the males and mixed with the eggs in a plastic tub to achieve fertilization. Fertilization must be quick, because tiny openings in the eggs close soon after water touches them. 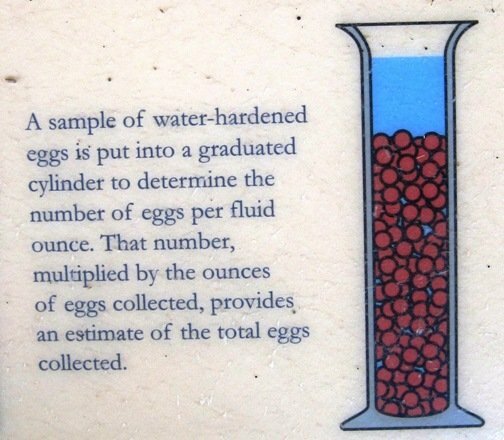 About the size of a pea, fertilized eggs absorb water for a few hours in water hardening tanks, where they are treated with various compounds to prevent disease, then measured into incubators. Dead or unfertilized eggs turn white and are removed. 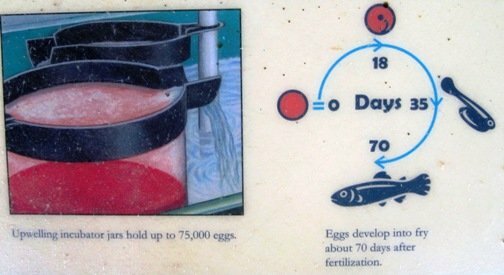 Hatchery staff carefully collect eggs from the fish and tend to them until they hatch. Young fish are reared in the Hatchery for up to a year, before they are released into the wild to begin their migration to the ocean, where they will mature and return to their home stream to reproduce. Learn more about California Department of Fish & Game Fisheries – Hatcheries when you’ve got some free time. Print out the U.S. Fish & Wildlife Service – The Pacific Salmon and Steelhead Coloring Book for a bit of family fun at home! The Hatchery provides group tours for schools, clubs, scout troops, and any other organized group that is looking for an educational experience. The topics covered on a tour are: the biology of chinook salmon and steelhead trout, the purpose and operations of the Hatchery, and the importance of preserving river watersheds. The Hatchery provides a limited amount of tours due to low numbers of staff. When reserving a tour, a two week advanced notice is highly recommended. Q. 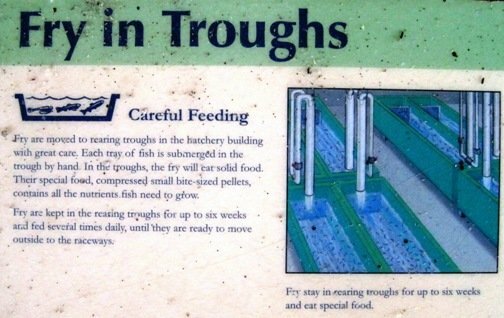 Does the Mokelumne River Fish Hatchery raise catchable trout? A. This hatchery only raises Chinook Salmon and Steelhead Trout. Q. Who do I call to find out if the Mokelumne River is open or closed to floating? A. The San Joaquin County Sheriffs Department is the agency to call since they have the authority to close and open the river. Q. Are dogs allowed on the grounds of the Hatchery? A. Dogs are allowed as long as they are on a leash. Q. Is the Hatchery wheelchair accessible? A. The trails at the Hatchery are all paved and wheelchair accessible. Visit http://www.dfg.ca.gov/fish/Hatcheries/Mokelumne/Questions.asp for more Frequently Asked Questions. From Highway 12, turn north on McIntire Road. At the end of McIntire Road, turn right and follow the road straight until entering the Hatchery’s parking lot located at the base of Camanche Dam. Located about 2 miles east of Clements. 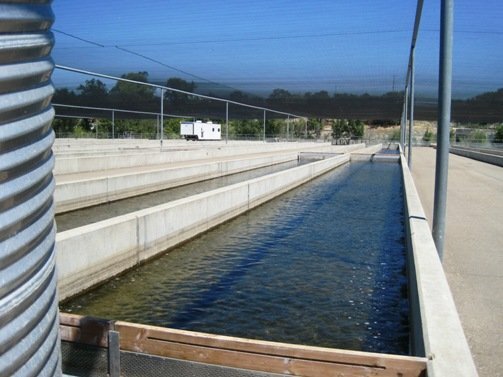 Check out http://www.dfg.ca.gov/fish/Hatcheries/Mokelumne/Facility.asp for more pictures and information. 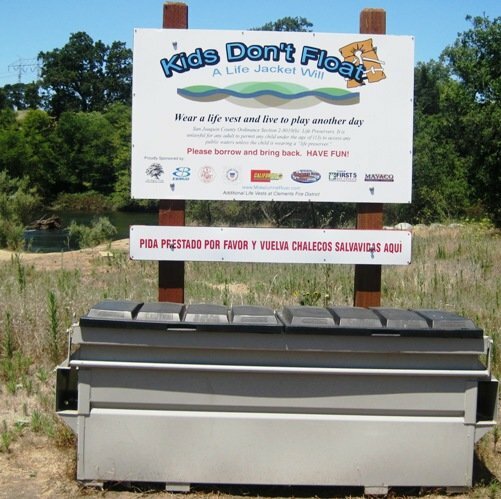 Just down the road from the hatchery is the Mokelumne River Day Use Area, which is also maintained and operated by the East Bay Municipal Utility District. A popular spot for picnics, fishing, and taking in local bird life, the area is open daily from sunrise to sunset and costs nothing to visit. As a wonderful added bonus, life jackets are made available to visitors for safe water play. This entry was posted on Monday, July 18th, 2011 at 10:41 PM	and is filed under Nearby Attractions. Both comments and pings are currently closed.